Rosen Plaza Orlando, business/convention hotel with family-friendly amenities, is welcoming Shriners for the East-West Shrine Game with group rates and other services © 2010 Karen Rubin/news-photos-features.com. Rosen Plaza in Orlando will serve as the headquarters hotel for the prestigious East-West Shrine Game from January 16-22, 2011, and is offering up special group rate for Shriners and fans of the East-West Shrine Game. The hotel will also be the location for the annual Players Award Banquet on Friday, January 21, 2011. The banquet includes the induction of some of the best NFL players in history into the East-West Shrine Game Hall of Fame. As college football’s premier all-star game, the East-West Shrine Game brings together North America’s top players in a friendly East-meets-West battle to benefit Shriners Hospitals for Children, an international pediatric specialty health care system. The Jan. 22, 2011 game marks the 86th anniversary of the legendary all-star college football matchup, which was established in the San Francisco Bay area in 1925 and is coming to Orlando for the first time ever. Having hosted some of the country’s most prestigious football games – the annual Capital One Bowl, Champs Sports Bowl and Florida Classic, the nation’s premier HBCU event – Orlando was a natural choice for the East-West Shrine Game. While the game will be held in downtown Orlando at the Florida Citrus Bowl Stadium, the award-winning Rosen Plaza, located on International Drive, was chosen to host East-West Shrine Game executives and personnel, football players and their families, sponsors and fans. 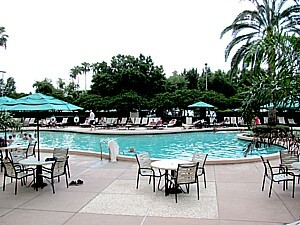 Organizers of the game selected Rosen Plaza as the headquarters hotel from among many other Orlando hotels based on its luxurious accommodations and meeting facilities, its tropical resort setting, its reputation for outstanding guest service and its superior catering and dining options. Rosen Hotels & Resorts and the Harris Rosen Foundation are also well-known for their multi-million dollar charitable donations and corporate social responsibility programs, facts that were not lost on the Shriners organization. Rosen Plaza is extending a special group rate for Shriners and fans of the East-West Shrine Game. The Shriners organization also will offer complimentary shuttle service to and from the game on Jan. 22, 2011. For reservations and information, visit www.rosenplaza.com or call 1-800-627-8258 and ask for the Shriners rate for the East-West Shrine Game. Additional room nights are available upon request. The rate is based on double occupancy, subject to hotel availability; tax and gratuity are extra. These offers cannot be combined with other promotions or offers. The 800-room Rosen Plaza provides its guests with resort-style luxury in a world-class vacation destination. Guests at Rosen Plaza will enjoy accommodations in a deluxe room and a variety of amenities such as the outdoor heated pool and whirlpool and the Fitness center with “Life Fitness” cardiovascular and exercise machines and a full-range of free weights. Four on-site restaurants include Jack’s Place, voted the number one restaurant on International Drive by Orlando Magazine, with casual fine dining. Café Matisse offers buffets as well as full breakfast, lunch and dinner menus. Rossini’s Pizza serves fresh pizza and Italian specialties to go. The Lite Bite is open 24 hours a day and serves deli sandwiches and snacks. For entertainment, live music is featured on Friday and Saturday nights in Backstage Nightclub & Sports Bar, International Drive’s original nightclub. The nightclub also features a live deejay on Thursday, Friday and Saturday, large dance floor, pool tables and dart boards, 50-inch LCD screen TVs throughout, free valet parking, VIP area, food menu and more. The hotel is conveniently located on International Drive across the street from Pointe Orlando’s incredible dining and entertainment complex. Other entertainment options include a 20-screen IMAX® stadium-seating theatre and popular retailers such as the Discovery Store, Brighton Collectibles and Artsy Abode. For an additional charge, guests may enjoy golf or spa treatments at Rosen Plaza’s nearby sister properties, the award-winning Rosen Shingle Creek or spa at award-winning Rosen Centre. Each of the summer packages include complimentary transportation to Shingle Creek Golf Club, The Spa at Shingle Creek and Body & Sol Spa at Rosen Centre, as well as scheduled complimentary transportation to and from Universal Orlando® Resort, Sea World Orlando® and Wet ‘n Wild Orlando. Rosen Plaza is only 15 minutes from the Orlando International Airport. For more information, visit www.rosenplaza.com. This entry was posted on December 20, 2010 at 7:11 pm and is filed under convention hotels, Florida. You can follow any responses to this entry through the RSS 2.0 feed. You can leave a response, or trackback from your own site. Hi there to every , for the reason that I am really keen of reading this webpage’s post to be updated on a regular basis. It carries pleasant material.